Most of you know about the plans underway for the 1st annual Little Fire Big Heart event benfitting Children's Craniofacial Association. I have a great group of friends helping me pull this thing together including reaching out to various businesses for corporate sponsorships. A few weeks ago, Ricky decided to contact a foundation that Tony Dungy, the Indianapolis Colts former head coach, is a part of called "All Pro Dad". He simply looked up the website, found an email address under Contact Us and sent a little bit about Aiden and the event. Just a day or so later, someone from Family First, the parent company of All Pro Dad, had responded asking him to send the information to a different email address. When he did, he received an out of office message that provided yet another contact person's info, including a phone number. So he called. And he got in touch with Tony Dungy's executive assistant. For a few weeks, they emailed back and forth - Ricky provided additional details about Aiden's journey, as well as answered questions about Little Fire Big Heart. Although we knew it was a long shot, Ricky's request was to see if there would be any way to have Mr. Dungy attend the event as a keynote speaker. You might be wondering what a former NFL coach has to do with our personal story. Why, you might ask, would his presence be relevant? Shortly after Aiden was born, one of Ricky's co-workers let him borrow Tony Dungy's book "Quiet Strength". I remember thinking it was a nice gesture, but I had visions of it collecting dust on our bookshelf until I reminded him many months later to give it back to the person that lent it to him. My husband does many things - quote lines from movies and tv shows, make a mean batch of dumplings, throw the kids into the air until they scream with delight - but one thing he does not do is read. However, to my surprise, less than a week later Ricky was raving about the book. It left a huge impression on him. I have not read it myself, but he said that the story was very inspiring. I think Ricky found that he could relate to some of the challenges and adversity that Mr. Dungy has faced throughout his life. What really resonated with him was reading how someone like Tony Dungy learned to rely on his faith to overcome some of the challenges that were presented to him. A few years ago, Mr. Dungy's teenage son committed suicide. He also has an adopted child with a rare medical condition. He, like all of us, has dealt with his fair share of pain and sorrow. Yet his ability to carry on with strength of character and a positive take on life is truly admirable. Something that Ricky was able to pull some strength from at a very difficult time for us as a family. Thus, his desire to connect with Mr. Dungy developed. We hoped to be able to have him speak to our event audience about making the best of things. About the importance of faith and family. About overcoming obstacles and helping our children do the same. During Ricky's coorespondence with the Family First contact, we were told that of 22 requests submitted last month, 5 were sent on to Mr. Dungy's desk for review. Ours was one of them. Wow! Although he is not available to speak at Little Fire Big Heart, we found out that he wants to donate to our cause! We wanted to provide the packet of information we put together for sponsors/donors and noticed that ironically, Family First has an office in Tampa - where we were going to be the following week for vacation. Ricky spoke to his contact person who arranged for us to drop off the event packet on our final day in Florida on the way to the Tampa airport to fly home. We brought the boys into the office with us even though we were expecting it to be just a quick stop inside. Unfortunately, the person we were supposed to leave the info with was out sick, but another woman knew we were coming and greeted us at the door. Just as we were about to head out, another woman said that the original contact person (who was not in the Tampa office) was on the phone and wanted to speak with her while we were there. She led us to her office and took the call. With a slight look of surprise, she hung up the phone and asked us to wait just a moment. Before we knew it, the Family First president, Mark Merrill, and Tony Dungy himself walked into the office and shook our hands! The look on Ricky's face was priceless. He was meeting one of his idols. This was a good day. We told Ethan that this was the Colt's old head coach, to which Ethan replied "Go Colts!" (Ricky has taught him well...) He met Aiden and we talked a little bit about his journey. He had information about our event in his hands - and not the paperwork we had just brought with us that day - emails. He really had reviewed our request personally. He said that he normally is not in the Family First office on Wednesday's but that it must have been God's plan to have us meet that day. He told us he knows the road of dealing with medical challenges with his own son quite well and he hopes the best for Aiden. He said he would love to partner with us in some way and make a donation to our cause. Then, to top it all, we were ushered into the media room for a quick picture with Mr. Dungy. We couldn't have ended our vacation any better! I am so proud of Ricky for following through with his idea to contact Mr. Dungy. He was persistant and it definitely paid off in the end. Hopefully we will be able to bring more awareness to craniofacial conditions with the help of Mr. Dungy's kind heart. 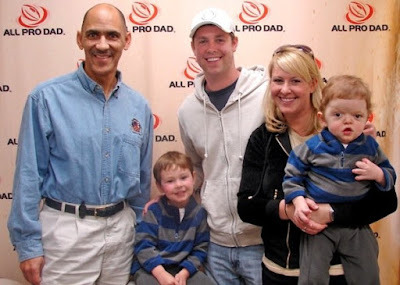 A HUGE thank you goes out to Tony Dungy and the staff at Family First/All Pro Dad! Bravo! You guys are amazing. 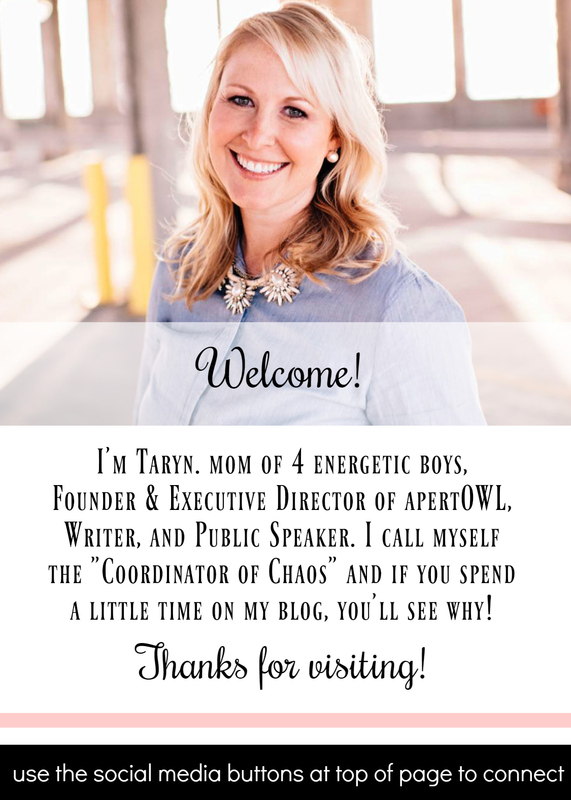 Love the new blogs. What a terrific vacation you guys had. I hope to make it to your charity event too. Awareness is key, I know of no other Apert children in our area and only one other Craniofacial child with crouzon. Let me know if I can help. We will hopefully have some surgery free time after this one in Feb. and that should finally free some time up for us. That is so AWESOME!!!! You guys are simply amazing, and it is wonderful and so fitting that the stars aligned for you to meet Tony Dungy. It was meant to be!! Even an avid Bengals fan has to see the awesomeness of this post :) Ricky certainly can be proud of this! I'm excited about the event. It's going to be great. It's amazing how things work out sometimes. Meeting Mr. Dungy must've been great. In addition to all his NFL fame, I've always liked him since he played for my alma mater, the University of Minnesota.